There's a new revolution happening overhead. The drones are coming. A combination of Military research and mass produced cel phone technology have enabled a new wave of domestic drones. Amazon.com plans to deliver goods to your door using drones and Google has designed a drone like no other. Farmers in Japan already spray 90% of soy crops with drones. But drones also raise many issues. Anyone can fly one, putting them into restricted airspace and endangering lives. Flying by remote makes it impossible to know where the pilot is. There are huge concerns about privacy. There are super-surveillance drones that can see objects six inches across from 30,000 feet, and track your movements all day long. At the same time Drone Journalism is the new medium that allows the watched to watch the watchers. New capabilities of incredible speed and precision are being tested, with drones built to look like birds and bugs. There are future uses that are still only ideas, but coming fast. The drones have come home and are here to stay. The question is: who gets to use them, and how? 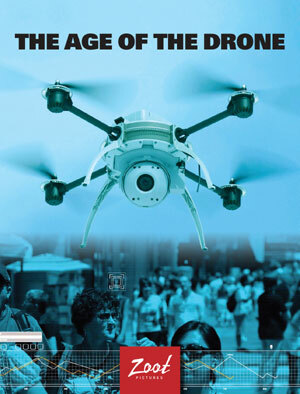 THE AGE OF THE DRONE is produced by Zoot Pictures Inc. in association with the Canadian Broadcasting Corporation, and with the participation of the Canadian Media Fund, the Canadian Film or Video Production Tax Credit, and the Manitoba Film and Video Production Tax Credit.